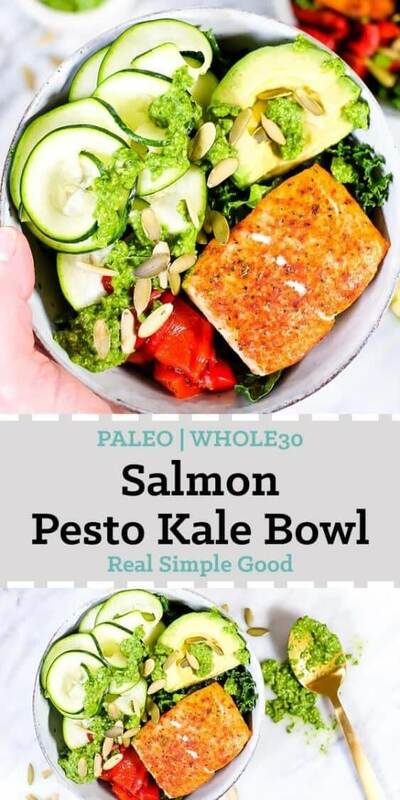 I love a good bowl meal, and this Paleo and Whole30 salmon pesto kale bowl might just be my latest favorite! 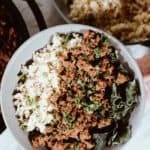 Justin likes bowl meals, although probably not quite as much me, but he approves of this one and I think you will, too! 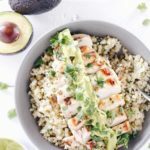 It’s a Paleo and Whole30 recipe that is also low carb! It’s full of healthy fats, loads of flavor and just the right textures! You are going to love this combo of flavors and colors. 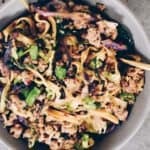 It’s such a bright and cheery Paleo and Whole30 bowl! 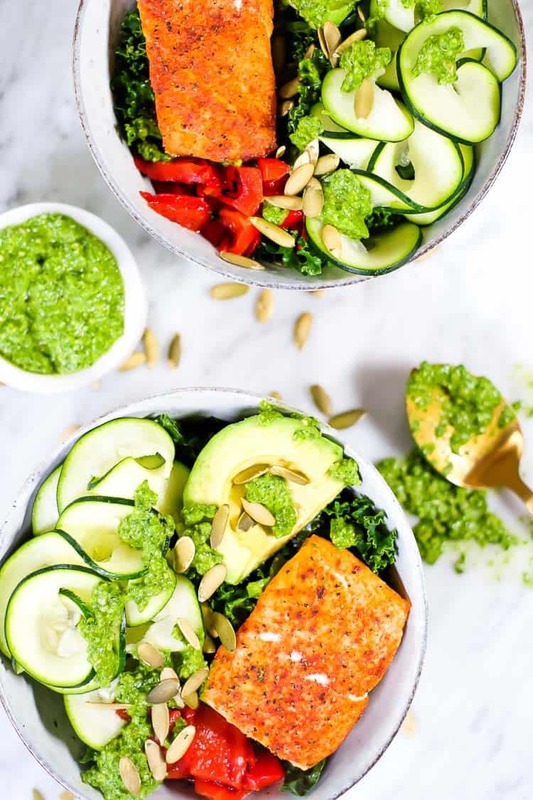 We like adding pumpkin seeds or sunflower seeds to our pesto to give it a little extra texture in the absence of cheese since we opt for a dairy-free version. For this recipe, we went with pumpkin seeds for a lower carb option, and also for their health benefits. In this post, Dr. Mercola touts pumpkin seeds as “nutritional powerhouses” for their nutrients and antioxidant properties. 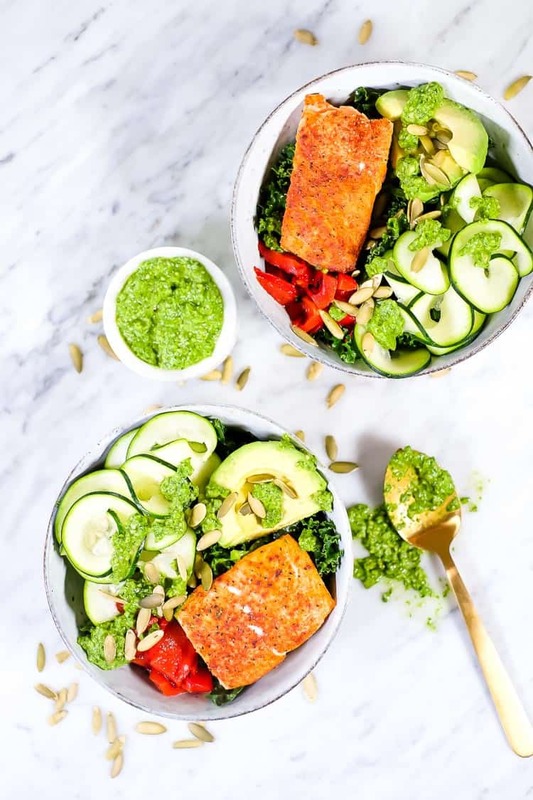 We think they’re pretty tasty too, and you won’t even miss the dairy in this salmon pesto kale bowl! Growing up I always wanted my foods on a plate and separated. Like nothing should touch and I ate them all separately. How boring is that? Well, when I became an adult I also became less strict on the food not touching and slowly began veering toward a preference for bowl meals. 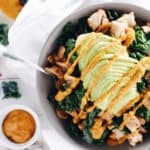 Now I pretty much love mixing all of my foods together in a bowl and getting a little bit of all the flavors in each bite! So much more tasty and satisfying! Plus, it is kind of fun playing with various toppings and different combinations of veggies, proteins and sauces. For this recipe I ended up using a combination of curly kale and dinosaur kale. 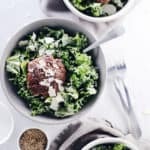 Then, I like to mix it up with the pesto sauce before getting to the rest of my bowl so it has some time to soften the kale a bit a make it more tender for eating. 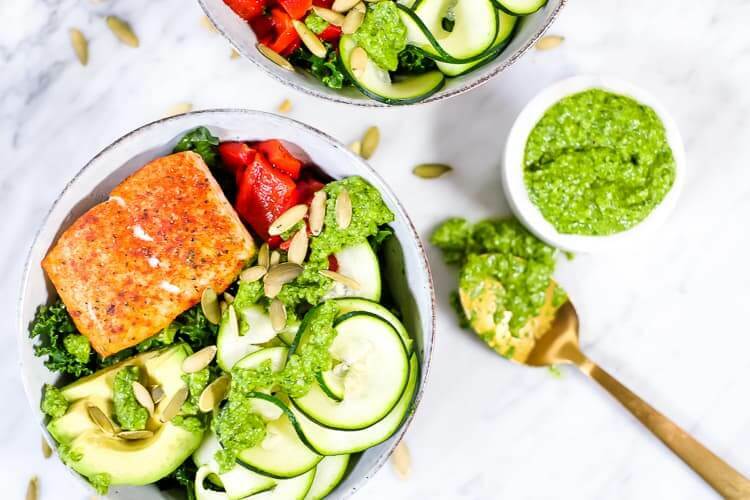 Get creative and grab a couple different kinds of kale at your market, then mix it up with the pesto sauce and let it take the edge off before you assemble your bowl. You’ll see why this has become a favorite combo real quick! We LOVE the fish delivery company Fish Fixe and have decided to partner with them to help you reel in the health benefits of more fish in your diet. We’ve found that having our freezer filled with perfectly portioned seafood has made adding it in every week a no-brainer. Our friends over at Fish Fixe have kept our freezer stocked and inspired us to get creative and have fun with fish! We love Fish Fixe for many reasons, but mostly because they deliver seafood that has No Antibiotics, No GMO’s, No Chemicals, and is Sustainably Sourced. And to top it all off, they have really amazing customer service! They’re just good people, like the kind you’d want to be friends with and invite to your own table! 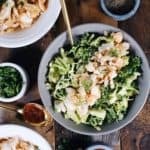 We’ve partnered with Fish Fixe to bring you a special discount – use the discount code REALSIMPLEGOOD at checkout to receive $10 off your first box! You can get their regular box filled with an assortment of seafood, or you can also customize your box to contain exactly what you prefer! If you’re looking to up your intake of healthy fats and seafood like us this year, make sure you check out Fish Fixe! And we’ll have you covered with lots of fish recipes to make it fun and easy! 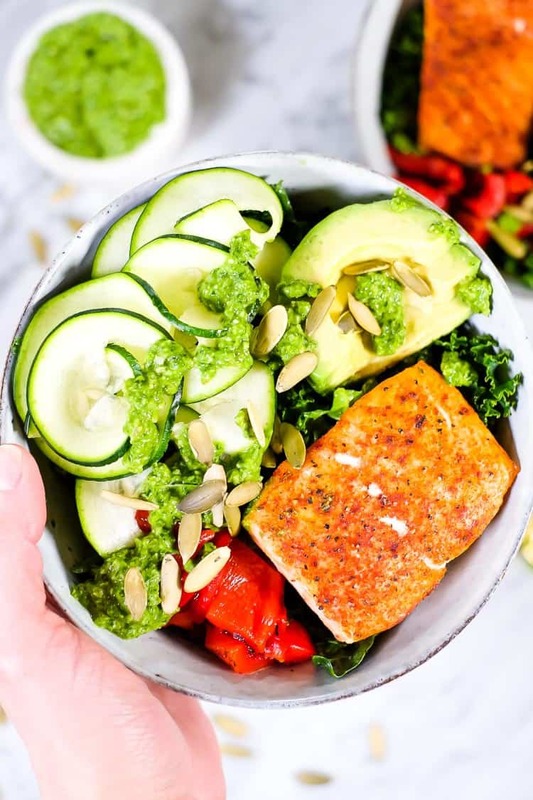 Looking for a bowl meal with tons of flavor, all the healthy fats and some veggies too? 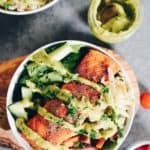 Go ahead and make this salmon pesto kale bowl! Let us know how it goes by leaving a comment below. Also, take a photo and tag us on Instagram @realsimplegood, so we can check it out! Give us a follow on Instagram as well if you don’t already! 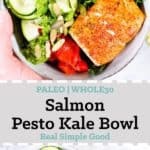 This Paleo and Whole30 salmon pesto kale bowl might be my latest favorite bowl! 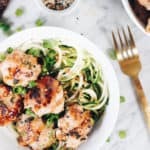 It's a Paleo and Whole30 recipe that is also low carb! It's full of healthy fats, loads of flavor and just the right textures! You are going to love this combo of flavors and colors. 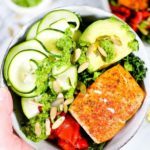 It's such a bright and cheery Paleo and Whole30 bowl! Place salmon fillets on baking sheet and season with the smoked paprika, garlic powder and a pinch each of salt and pepper. Place in the oven to bake for 15-20 until flaky with a fork. Cooking time will vary depending on the size of your fillets. While the salmon is cooking, make pesto sauce. Place all of the sauce ingredients (except for the olive oil, salt and pepper) in a food processor and process until everything is pulverized. Stream olive oil in white the food processor is running. Stop once combined and taste. Season with salt and pepper to taste. Place kale in a large mixing bowl and add 2/3 of the pesto sauce to the bowl. Mix pesto into kale and then place in the fridge until the salmon is done and you're ready to serve. Once salmon is done, remove kale from fridge and assemble bowls. Start with a bed of the pesto kale. 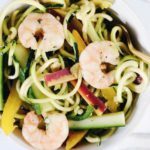 Add spiralized zucchini, roasted peppers, avocado and salmon. Drizzle more pesto on top of everything. Sprinkle some extra pumpkin seeds on top. Serve and enjoy! I am so happy you posted this! I like grilled salmon, but cooked…not so much. This looks excellent! Thank you!